It doesn't occur when I go straight from a stop or on right turns. My car has been into Lexus four times and they found nothing because I can't reproduce the 3-second hesitation on demand. The last visit they had the area engineer and, like the other visits, they found nothing unusual, saying the traction control was working as it should. I really don't think, when you make a left turn in front of traffic, the traction control should activate without any slippage of the tires. There's no way to shut off the traction control, according to Lexus, because it is a safety feature. Any thoughts? A. Any intermittent problem is very frustrating not only for the driver but also for the shop trying to repair it. I have a couple thoughts and observations from what you have shared here. First, if my calculations are correct, you are about to go out of warranty so I would try to get this resolved. At a minimum make sure it is documented properly, which you probably have since you have been to the dealer four times. It seems from your description that the computer is seeing wheel slip and engaging the traction control when it is not required, so the question we have to ask is why? My "armchair quarterback" guess is that maybe you have a bad signal coming from one of the wheel speed sensors telling the computer "Hey I'm spinning" when it really is not. Perhaps this is brought about on one wheel, in a left turn, when that wheel gets loaded a certain way. We used to see a similar situation on some of the GM products on stopping. Just before you would come to a stop on dry pavement the vehicle would go into "anti-lock braking" for no reason. We would figure out which sensor it was by taking an oscilloscope and scope each sensor to find the one with a bad pattern. The dealer may have already done this and the pattern may be fine in normal conditions and only acts up when the tire is loaded in a turn, but if they haven't scoped the sensors it might be worth a try. The next idea would be to drive the car with a scanner that takes a "movie" of the data so when the power outage happens, the problem is recorded. The main reason I believe it relates to a speed sensor at the wheel is because it only happens on a left turn and I agree this is very dangerous. When the traction control is engaged, the power is pulled back big time. Lastly, look at the owner’s manual and make sure there is not a traction control on/off switch. It might be on the shifter control. 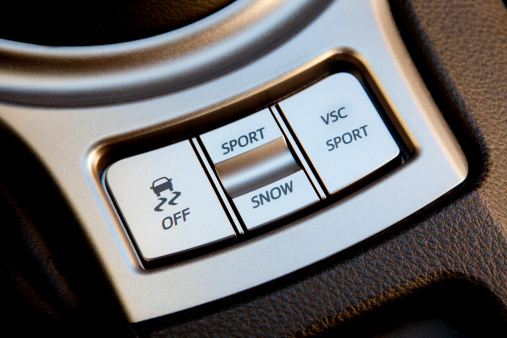 Most cars give you the ability to turn off the traction control. If you have it, turn it off and drive the car for a while so you can at least be 100 percent sure the problem involves the traction control.